There are many reasons to add breakfast to your daily routine. This one simple change can positively impact your energy level, blood sugar level, weight and even your ability to focus and be productive. The key to gaining these benefits is to add a healthy breakfast, but not one high in fat or sugar. The best options are foods that are protein- and fiber-rich. Breakfast is an important tool in maintaining effective cognitive functioning. For example, the USDA reports eating breakfast may help improve school children's scores in math, reading, and standardized tests. It also cites studies that found breakfast helps improve attention, problem-solving ability, and memory. According to Diabetes.org, people who forgo breakfast are not as productive at work, are less effective problem solvers, and have less mental clarity compared to people who regularly eat a healthy breakfast. If you struggle with a lack of energy or frequent energy slumps mid-morning, you may be inadvertently causing this condition by skipping breakfast. Your brain and body need glucose in order to function effectively. After fasting all night, breakfast fuels your body so you start the day with energy. Eating breakfast may be an effective component of a weight-loss program. The USDA reports studies that children who regularly eat breakfast less likely to struggle with weight problems. According to Diabetes.org, people who eat breakfast tend to take in less calories in a day than their non-breakfast-eating counterparts. The website also states that individuals who do not eat breakfast tend to snack more on sugary or high-fat foods, overeat in the evening, and are more likely to be overweight. One reason for weight gain among non-breakfast eaters may be due to the prolonged fasting state the body enters into when one goes too long without eating. When the individual finally eats, the body tends to store the food as fat, as a survival mechanism. If you skip breakfast, you may also be depriving your body of adequate nutrition. Diabetes.org reports that breakfast skippers tend to be deficient in minerals such as calcium, in addition to not getting enough fruits and vegetables that provide important vitamins. The USDA confirms this by citing studies showing students who eat breakfast get more important nutrients, vitamins, and minerals than those who don't eat in the morning. 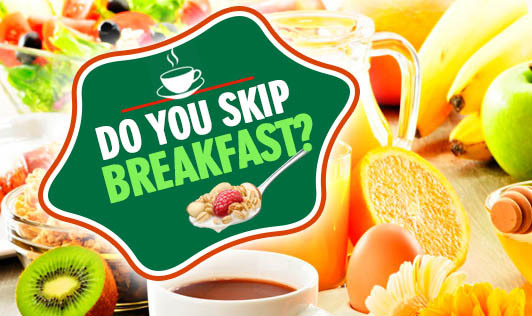 According to Arthritis Today, there are other problems with skipping breakfast, including a risk of developing high levels of low-density lipoprotein (LDL), the "bad" cholesterol implicated in heart disease. The website also reports studies that find a higher level of resistance to insulin in individuals who consistently miss their morning meal.